R. Hancock fecit" to the left, below the dog. 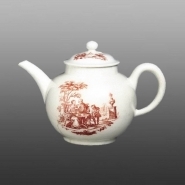 The Tea Party and the Wheeling Chair are also found as single prints on Bow porcelain (see below) and shards of both these prints have been found on the factory site, see G&S Guy-Jones, Bow Porcelain, ECC (2013) pp 83-5.
and the Wheeling Chair to the other. This Bow plate has a painted floral border and is printed in red with a combination of the Tea Party and the Wheeling Chair. Both these designs are included in the 1756 drawing book printed for John Bowles. 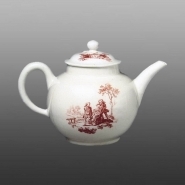 This combined print is the only design on Bow porcelain that bears the signature of Robert Hancock, although a number of other prints on Bow porcelain appear to be from his engravings. It is signed "R. Hancock fecit" to the left, below the dog.